Juli 17, 2013 -Venner af den nationale Parks Foundation (FNPF) transformed muddy mangrove forests and swaying sea grass fields into a classroom for a day to help teach a group of Balinese high school students about conservation. Earlier this month FNPF and about 25 students and teachers went on a monitoring field trip as part of UNESCO’s Sandwatch conservation education program. FNPF has teamed up with UNESCO to run the Sandwatch program at three high schools on Nusa Penida and Nusa Lembongan islands, just off the coast of Bali. Through Sandwatch students, and community members, learn about climate change and conservation, and together study and analyze the issues facing their local environment. They decide whether any local problems could be caused by climate change and look at possible solutions. FNPF has been running the Sandwatch program on Nusa Penida and Nusa Lembongan since the beginning of the year. Om 9 Juli, 2013 students from two of the schools – SMA 1 Nusa Penida and SMKN 1 Nusa Penida – got together for an observation field trip to neighboring Nusa Lembongan. 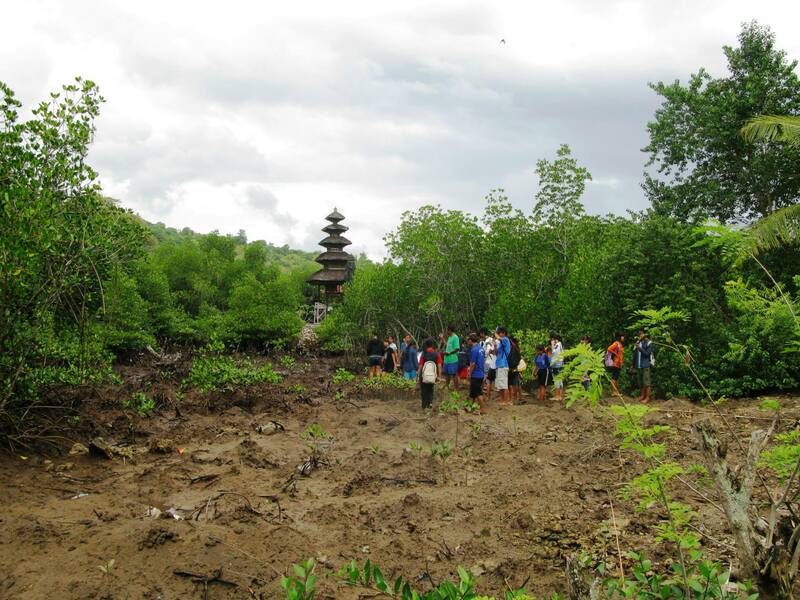 Trekking through knee-deep mud the students visited a mangrove forest where they had previously planted 600 kimplanter. The saplings, planted a couple of months earlier, were healthy, strong and growing well. Next the students boarded an old traditional Indonesian fishing boat and sailed a short distance out to sea to check the condition of the sea grass fields found around the island. Plenty of sea grass means the water and the ecosystem is healthy and clean. The students had the chance to snorkel and monitor the seagrass up close – they found it was in excellent condition. Travelling further out the young people dived back into the water to snorkel through one of the coral reefs surrounding the island. They saw many different species of fish swimming through the coral, which means it too is healthy. The water was very clear, an indicator of why the coral and sea life was flourishing. “It was a great day, and it gave the students the chance to learn about monitoring and to observe first hand why protecting their environment is such an importance issue,"Siger FNPF CEO og grundlægger Dr. Bayu Wirayudha. The next day FNPF staff and volunteers met the students at their school to talk about how they could interpret the information they had collected over the last seven months, as well as the ways they could improve the environment on Nusa Penida. The students have another seven months of activities to come as they continue the Sandwatch program. Sandwatch is one of many diverse projects FNPF is involved in on Nusa Penida. If you would like to help us protect one of Indonesia’s magical islands please donate today. Every donation counts.